How do I translate ProjectHuddle into my language? Check our Community Translations Site! Want to use ProjectHuddle in your language? We set up an online translation tool called Glotpress that lets you download, suggest and contribute translations! The list of supported languages is always growing, so please check here first! ProjectHuddle may already be translated in your language. These languages are updated on every new plugin release, but should you want to get these translations immediately, you can do so by following these steps! Export the .mo file by selecting "Machine Object Message Catalog" from the dropdown and click "Export". Export the .po file by selecting "Portable Object Message Catalog" from the dropdown and click "Export". Add these files to the wp-content/languages/ph/ directory of your WordPress installation. You can also decide to translate you own version of the plugin. This is helpful if you want to have your own wording for instance. In fact, you can even change the default English translations for the plugin. The Poedit program lets you translate .po/.mo files on your computer. Load the .pot file. 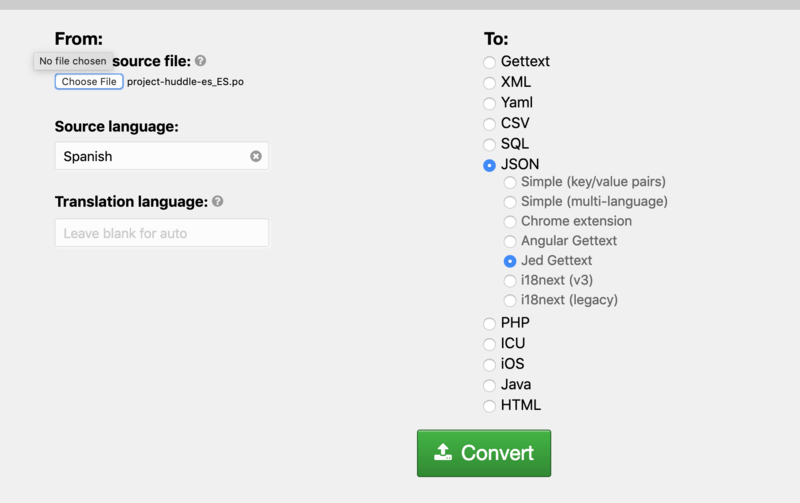 Find the "ph.pot" file in your "languages" folder of the Project-Huddle plugin. Open it with poedit, and translate. Save your translation. When complete, you’ll want to save the file twice, as two separate files – a .po file and a .mo file. When you save the files, you must name them according to your language code with "project-huddle" prefix. Find a list of language codes at WordPress in your Language.